What Happens to Your Estate Planning after Divorce? Marriage brings a lot of change beyond the emotional and practical shifts in location and behavior. Many legal rights and obligations are created as of the day a couple marries that create implications reaching far into the future, including after death. While estate planning may not be on the agenda of newly-married couples, at some point, most discuss what they want to happen to their property and other interests when one or both of them die. Estate planning is typically approached with the expectation that a couple will remain married for the rest of their lives, but divorce is a possibility, and if divorce does occur, it greatly affects the execution of estate plans. Many provisions exist within the law that automatically disinherit former spouses, as it would make little sense to allow an ex-spouse to inherit under the circumstances. However, certain types of estate plans are not so easily undone, and understanding how various estate plans are treated post-divorce is important to making the right decision for each person’s long-term interests. Wills are fairly simple to correct in the event of a divorce. Florida law will not allow an ex-spouse to inherit property under the terms of a will, and voids any provision that specifically affects the rights of the former spouse. Instead, the former spouse is treated as if he/she died at the time of the divorce declaration, and the property passes to the next individual designated to inherit in the will. However, note that if a future will is created after divorce that designates the former spouse to inherit, this provision will likely stand. A number of exceptions, beyond the scope of this discussion, exist to the general prohibition of an ex-spouse from receiving this property, which should be reviewed with a knowledgeable estate planning attorney if divorce is contemplated. Divorce and revocable trusts are easily addressed because the same rule that applies to wills and assets that pass via contract are also applied to these documents. Thus, the former spouse is treated as deceased and any provision that affects the former spouse is void if the trust was created prior to the dissolution. Irrevocable trusts, however, are much more complicated to undo since only the trustee or a beneficiary are freely allowed to modify the trust. These individuals are usually the spouse, and they rarely want to change the terms of the document since they would lose rights to the property. In this situation, the spouse who created the irrevocable trust must ask the court to modify the trust based on mistake, a costly and lengthy process. Usually, the best way to avoid this legal minefield is to include a provision in the trust that automatically voids it upon the divorce of the parties. An estate planning attorney can advise on the best way to structure this arrangement so the intent of the creator is protected regardless of future events. Estate planning is an important and necessary process to ensure your property is distributed according to your wishes after your death. The law in this area is complex, and many events and issues can affect the validity of estate documents. The Tampa law firm of Bubley & Bubley, P.A. 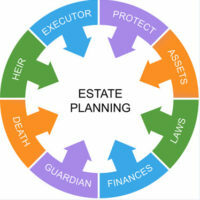 works to preserve the financial security you spent a lifetime to create for benefit of your heirs. Contact us today for a free consultation.